In 2010, Al Jazeera’s ‘insane’ journalist Jane Dutton conducts one ‘lazy’ interview with President Afwerki, based entirely on fabricated reports. Everything she accuses him of at that time are now proven to be nonexistent. She must have abused her stupidity beyond limit. This transcript is from an interview done by Eritrean President Issias Afwerki and Al Jazeera “journalist” Jane Dutton in February 20, 2010, shortly after the UN Security Council passed punitive sanctions against Eritrea based on what has now been proven to be fabrications. The sanctions are now history and this interview stands as an example for aspiring journalists of just how low their seniors will stoop. Everyone of the charges leveled by Ms. Dutton against the President were fake, yet this racist white South African woman continued to insult Africa’s leading statesman for the entire interview. Would she even have considered treating a white European leader the same way, to rudely insult and sling falsehoods and fantasy at such a prominent and respected African leader as Isaias Afwerki? See that for yourself …in the following transcript .. 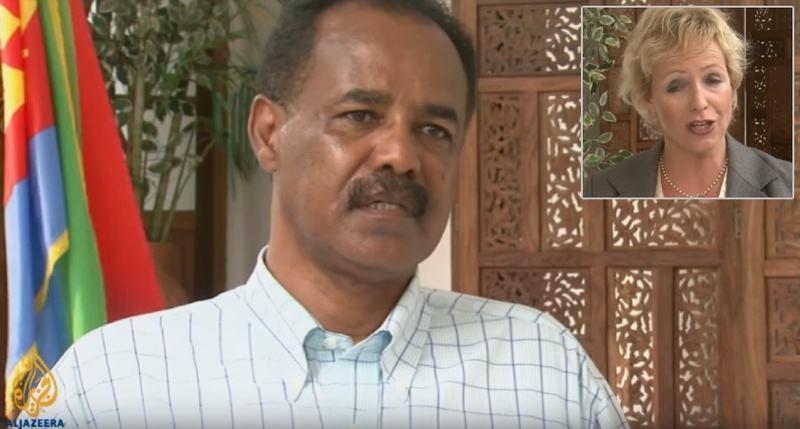 In this interview, which Jazeera’s Jane Dutton rightly describes as “rare”, President Isaias Afwerki (PIA) tells her that all accusations leveled against him, including the recent UN sanctions against his country, are the work of none other than the United States. Jane Dutton : Mr. President, in December the United Nations imposed sanctions on Eritrea for supporting armed groups such as Al-Shabbab. Do you feel that you have been unfairly victimized? PIA : No, it is a mockery of justice and history. In our political culture we have never believed and we don’t believe that religion is a substitute for political problems in any one country or any society. anything and we did not want to get involved. But because of that initiative we went and contacted everybody in Somalia. Jane Dutton : Are you, therefore, saying that the Al-Shabbab, the African Union and the United Nations are all lying? Jane Dutton : Why would the United Nations and the African Union say that you are doing these things? PIA : Where are these evidences in the first place? What are they saying? This is where I come to say that this is a mockery of justice. PIA : This is nonsensical, this is a mockery, this is a joke. Jane Dutton: Are you using Somalia as a battlefield to fight Ethiopia? PIA : It is not a battlefield with Ethiopia. This border issue was a senseless conflict instigated by the United States in the first place. And we went to arbitration and arbitration was done almost eight years now, in 2002. That decision is now blocked by the United States; it is not blocked by Ethiopia. Ethiopia does not have the resources and the means to block any decision of arbitration and implementation. It is a cover up for the failure of the misguided policies of the United States in the Horn of Africa for the last twenty years. Jane Dutton: So, if Ethiopia were to withdraw from Badme, that is the border town that you are referring to, if they were to withdraw from there, then would you take this country off the war footing? PIA : We don’t have any problems with Ethiopia; we have never had a problem with Ethiopia. We have worked with its people for almost two decades to overthrow a government in Ethiopia, and we want to see a relationship between Eritrea and Ethiopia based on mutual respect and commonalities of interests and we have worked for that for decades. Jane Dutton: Can you say that that is your relationship with Ethiopia? Please explain to me what your relationship is with Sudan because you have alleged connections with the GEM and the SLA? PIA : This is again a distortion of history. It is a deliberate distortion of facts. Jane Dutton: The Sudanese government has said that it stopped GEM fighters from coming into your country…. PIA : They have never said that. No Sudanese government or official has said that because they can not prove that. It is said in the name of Sudanese officials and the government and this is a distortion of facts. PIA : No, no, no, never! That never happened. In Abuja when negotiations were under way we said this is not a solution. There has to be a conclusive and comprehensive peace process in the Sudan to address the issues of Southern Sudan, Eastern Sudan, Central Sudan, Northern Sudan and Darfur. We have never entertained the idea of intervening this way or that way to support one group against the other. Jane Dutton: And that is not what you are doing in this region….? PIA : ….this is destabilizing Somalia and by destabilizing Somalia, you destabilize the region. Jane Dutton: You are friends with Israel and Iran. How do you balance the two? PIA : That is another joke. Why would the United States impose an arms embargo on Eritrea, a small country with limited resources, and not impose sanctions on the alleged role of Iran in the region? How can you possibly appreciate the logic behind this position of the United States? PIA : There is no role for Iran in this region. Eritrea is not for sale. Eritrea is not for sale not to Iran, not to Israel not to the United States, not to anybody. Jane Dutton: If Eritrea is not for sale, then how do you justify providing arms to the Hamas…? PIA : We don’t even have any diplomatic relations with any Palestinian organization. Jane Dutton: But you are allowing Iran to supply arms to Hamas through you…? PIA : Where are the evidences? Do we need weapons from Iran? If we want to give weapons to anyone, we don’t need it from Iran. We don’t need weapons from Iran. We have more than we need. We can arm three or four governments. We don’t need weapons from Iran. We do not have the political will to work on behalf of anybody in this region. Never! Jane Dutton: If it is not political will then what is it? Because they are going through you into the Sudan…. PIA : There is no Iranian presence in this region. Not in Eritrea. Jane Dutton: There is Iranian presence in Assab. They have a military base there and they are helping you with your oil refinery…. PIA : I would invite you to go and visit Assab. There is no refinery there. This is a joke; there is no refinery there. Jane Dutton: Well then the evidence, as well as Israeli planes that stopped arms shipment to the Sudan, where they got Iranian revolutionary guards…..
PIA : Where are the evidences? Where are the evidences? Can you prove to anyone that you have evidences to say that Eritrea is shipping arms to anywhere else in the world? Jane Dutton: You have a relationship with Iran as well as Israel. How do you balance that? Or are you saying you have no relations? PIA : Not at all How can you possibly and logically understand such a contradictory reality? Jane Dutton: That is why I am asking…..
Eritrea. How can one person sensible understand that logic? Jane Dutton: But that has raised questions…Many political analysts believe that the next proxy war between Iran and Israel is going to take place on your soil. Are you prepared to be the next Vietnam? PIA : This is a joke. This is giving Eritrea a name beyond its means. These are fabrications. These are allegations without facts to prove them on the ground. It is sometimes a surprise why people want to sell these lies to any sensible person in the region. It does not make sense. Jane Dutton: So do you deny that you are supporting the Houti’s in Yemen? PIA : This is a fantasy in the minds of those who want to sell the idea and create a sense of threat and fear in this region so that they can manipulate it for their own agendas. Jane Dutton: Is this also a fabrication? The United Nations says that you spend 200,000 to 500,000 dollars supporting fighters? Jane Dutton: In Somalia and around the region. Is that also a fabrication? PIA : This is another joke, this is another joke. Jane Dutton: How can your country….that is from the United Nations…..
PIA : It is boring, it is boring. When jokes are repeated again and again they become so boring. Jane Dutton: How can you as a country afford to be on this war footing. It’s not twenty years…. PIA : This is a fantasy on the part of those who think that we are on a war footing. Jane Dutton: If your country is not on war footings then how come there is so much repression? There is no freedom of the press, there is no freedom of speech…. PIA : I can understand where you come from, and this is another boring joke based on fabrications. Jane Dutton: Can people leave this country when they want to? PIA : Did you enjoy the show yesterday? Jane Dutton: Can anybody leave the country when they want to? PIA : Did you see the people on the streets? Anybody can leave this country anytime. Jane Dutton: Can they get a passport? PIA : What is it to get a passport from a country that you deserve to be a citizen of? Jane Dutton: What about freedom of the press? Eritrea jails more journalists than any other country in the world. Why do you have to resort to that? PIA : These are lies. Jane Dutton: You don’t jail journalists? PIA : These are lies. These are lies of Al Jazeera international deliberately distorting facts to give the impression that this country is in a war footing and so many things such as Iran is here, Israel is here, we are supporting Houtis, we are supporting terrorists you name it. You are using these lies to serve an agenda to destabilize this region. I would never do anything to destabilize the region…. Lies and lies and lies and lies. PIA : These are lies. These are your lies. Jane Dutton: So people are not leaving the country? PIA : Where….where… give me the evidences, give me the evidences. Give us the evidences, we would like to see the evidences. According to those reports the population of this country is out of town by yesterday. Jane Dutton: One of the reasons that many of the people leave is because of the indefinite military service, for both men and women. And the fact that you can never leave. Why is there this indefinite…. PIA : Again another lie. It is compromising your credibility as a media outlet. And coming up with a pack of lies and trying to convince anyone by putting them as facts on the ground and trying to give the impression that these are things that exist in the real world. Israel is here, who is not here…. Jane Dutton: But Israel is here, they have got a military base…. PIA : Everyone is here, Iran is here….I mean how can you possibly imagine that people will trust and believe what you tell them. You are talking about lies and …..
questions in order to give credibility to or to discredit your sources…. You are discrediting your sources, you are discrediting the United Nations when you come and tell in the name of the United Nations when the United Nations has not said anything like that. How can a media outlet with credibility come up with such lies? Jane Dutton: Let us talk about the drought in the Horn of Africa. Eritrea, as others, is suffering from it and yet you are reluctant to let aid workers into your country. What is the justification for that? PIA : When we have enough food, why do we need someone to feed us? Jane Dutton: Because two-thirds of your population is suffering…. PIA : Why do you want to spoonfeed us when we have enough food? Jane Dutton: How come two-thirds of your population is not getting that food? PIA : Then again how can you possible say and imagine that I am hungry when I am not hungry? Why do you want to believe that? Why do you want to believe that people are hungry and in need of your support? Why do you want to believe that? if you really want to…..
Jane Dutton: So there is no need for food aid…. PIA : We don’t need any food aid. We can feed ourselves. I am only bothered by why you want to feed us. life. Where did that come from and who was behind it? when I heard that. I said these people are crazy, they are out of their mind. day….We do not make promises and the people here don’t need promises. No one here promises anything to anybody. Jane Dutton: Will you allow other political parties to operate? Will you allow the constitution to be released? Will you allow an open political system that is governed by the people? PIA : By the people like in China? Jane Dutton: People who will call on the government to justify…. PIA : Again you are assuming that you are talking on behalf of the people of this country. Let the people talk. Jane Dutton: I am asking you…how you define…..
PIA : Let the people talk, let the people talk. The people will have to define it. Jane Dutton: Human Rights Watch says that you are turning this country into a giant prison and creating a human rights crisis…. PIA : You can walk around and see if that is true again. It is a lie. Jane Dutton: Why then do people come under the orders ‘shoot to kill’, if they want to leave this country? how can you imagine that happened? Jane Dutton: Who do you consider your friends? PIA : Where do you mean? PIA : A few, a bunch of liars may not be my friends but the whole world is behind Eritrea. Everybody is asking why all these lies? Why all these sanctions? Why this and that? It is an expression of the support of people. The minimum you can imagine sensible people asking simple questions about all the fabrications they hear everyday. That is by way of questioning the credibility of those telling the lies. Jane Dutton: Can you just tell us a little about your aspirations? Those who have never tried it may fantasize about going to war. We have been there for so many decades, almost two generations. At least we will not be like Kenya, Nigeria, Ethiopia, Somalia, Sudan.